The Muslim Council of Peel is in shock over the terrorism inflicting mayhem in New Zealand. Canadian-Muslims are reminded of the attack on the mosque in Quebec. The rise of right wing extremism is vividly real even more today. We are calling on law enforcement to heighten patrols at places of worship and in particular at mosques and Islamic centres. We are advising Friday worshippers to be aware of their surroundings and advising mosques to increase security. We are monitoring as events unfold in New Zealand carefully. We appeal for calm in the wake of fear. Our member organizations will offer special supplications for the victims and their families. 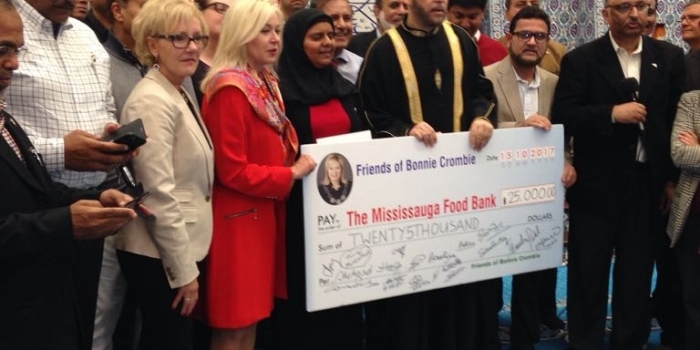 Muslim Community Presents $25,000 to Mayor Crombie’s 1 Bag Challenge for the Mississauga Food Bank.